FIGURE 1. For most dental procedures, personal protective equipment includes eye protection, a face mask, gown or lab coat, and exam gloves. One of the first steps when selecting PPE is to consider the requirements of the Occupational Safety and Health Administration (OSHA) Bloodborne Pathogens Standard. This requires that employers provide and ensure the use of appropriate PPE by employees with occupational exposure to blood and other potentially infectious materials (OPIM), including saliva. The standard dictates that PPE is appropriate “only if it does not permit blood or other potentially infectious materials to pass through to or reach the employee’s work clothes, street clothes, undergarments, skin, eyes, mouth, or other mucous membranes under normal conditions of use and for the duration of time which the protective equipment will be used.”3 For most dental procedures, this will include a long-sleeved gown or lab coat, eye protection or face shield, surgical mask and exam gloves (Figure 1). Several types of gloves are recognized as acceptable PPE in the dental office. These include nonsterile exam gloves, sterile surgeon’s gloves, and heavy-duty utility gloves. Gloves vary in their ability to resist punctures chemical penetration, and potential to cause allergic reactions based on the materials used in manufacturing. Sterile surgeon’s gloves are recommended for surgical procedures.4 Exam gloves and sterile surgeon’s gloves are regulated by the U.S. Food and Drug Administration (FDA), and a key difference is that sterile surgeon’s gloves have a lower threshold for defects than nonsterile exam gloves.8 Sterile surgeon’s gloves have not been shown to be significantly more effective in preventing infection during nonsurgical procedures, and, consequently, there are no recommendations for the routine use of sterile surgeon’s gloves for nonsurgical procedures. Unlike medical exam and sterile surgeon’s gloves, heavy-duty utility gloves are not regulated by the FDA because they are not used for medical procedures.4 Utility gloves should be worn when handling sharp contaminated instruments, during the cleaning and packaging of instruments in preparation for sterilization, and during all cleaning and disinfection procedures implemented in a contaminated operatory. FIGURE 2. Loupes should always include side protection to prevent eye contact with spray from dental devices, such as ultrasonic handpieces and air/water syringes. Surgical face masks play a critical role in protecting clinician mucosal tissues from contact with oral fluids, oper­ative debris and aerosols during patient care. Medical face masks are divided into performance classes based on their fluid resistance, bacterial filtration efficiency, and submicron particle filtration efficiency. They are also rated for flame spread.9 Medical face masks are designated either as level 1, 2 or 3, with Level 1 providing the lowest barrier performance and Level 3 offering the highest. Manufacturers label the mask with the level designation and must validate their claims with the FDA.10 Clinicians should consider the nature of the procedure when selecting face masks. Procedures with little or no potential for spatter could be performed using a Level 1 mask. When a higher likelihood of spatter is anticipated, dental teams should consider a Level 2 or Level 3 mask. Protective eyewear should be worn whenever aerosols, blood or OPIM may be generated during dental procedures.3,4 The OSHA standard identifies goggles or glasses with solid side shields, or chin-length face shields, as appropriate eye protection. Loupes should be fitted with side shields to protect the eyes from spatter that could enter from the sides (Figure 2). The protection must be sufficient to prevent blood, saliva, and other materials generated during dental procedures to reach the mucous membranes of the eyes. FIGURE 3. To remove treatment gloves, carefully grasp the glove’s edge without touching the wrist or hands and peel it off, turning the glove inside-out. Contaminated disposable gowns should be placed in a designated receptacle that is labeled with the universal biohazard symbol. Reusable contaminated gowns or lab coats should be placed in a designated container labeled with the biohazard symbol3 for laundering. According to OSHA standards, employees may not take soiled laundry home to be cleaned, but are permitted to launder items at the office if standard precautions are observed, including the use of PPE when handling contaminated laundry.15 Alternately, a professional service that launders items used in medical and dental facilities may be used. The CDC provides guidance on the correct sequence for placement and removal of PPE in health care settings.16 The first item to don is the gown or lab coat, and the second is a face mask. The mask should be worn with the ties or elastic bands at the middle of the head and the neck. The flexible band (if present) should be fitted to the bridge of the wearer’s nose, and the mask should fit snugly to the face, with its lower edge positioned below the chin. The mask is followed by placement of goggles or a face shield. Finally, after appropriate hand washing, gloves are donned. Gloves should extend over the cuff or edge of the gown or lab coat to completely cover the clinician’s skin. FIGURE 4. Remove a mask by grasping ties or elastics and carefully pulling it away from the face, without touching the front of the mask. After patient treatment, all exterior surfaces of PPE should be considered contaminated and handled with care to prevent contact with the clinician’s skin or clothing. Gloves should be carefully peeled off and turned inside out as they are removed, grasping the outside only with gloved fingers (Figure 3). To remove goggles or face shields, grasp the back of the earpieces or headband, remove carefully, and place in a receptacle until they can be cleaned and decontaminated. Disposable eye protection should be discarded immediately. To remove masks without contaminating the wearer’s hands and face, the clinician should grip the mask by the bottom ties or elastics, grasp the top, and remove without touching the front of the mask (Figure 4).16 Remove gowns or lab coats by turning them inside out and placing them in a designated bin for laundering or disposal. Oral health care professionals must be well versed in the appropriate procedures when selecting and using PPE if they are to be successful in reducing the risk of exposure to infectious agents. Dental teams need to have an effective protocol in place to ensure the safety and well-being of staff members and patients. By mitigating the risk of cross-contamination, the use of personal protective equipment (PPE) — including eye protection, a face mask, gown or lab coat, and exam gloves — protects dental team members and their patients. The Occupational Safety and Health Administration Bloodborne Pathogens Standard requires employers to provide and ensure the use of PPE by employees with occupational exposure to blood and other potentially infectious materials, including saliva. Hand hygiene should always be performed before donning and after removing gloves. Utility gloves should be worn when handling contaminated instruments, during the cleaning and packaging of instruments in preparation for sterilization, and during all operatory cleaning and disinfection procedures. After patient treatment, all exterior surfaces of PPE should be considered contaminated and handled with care to prevent contact with the clinician’s skin or clothing. Redd JT, Baumbach J, Kohn W, Nainan O, Khristova M, Williams 24 I. Patient-to-patient transmission of hepatitis B virus associated with oral surgery. J Infect Dis. 2007;195:1311–1314. Radcliffe R, Bixler D, Cleveland J, et al. Infection control: hepatitis B virus transmissions associated with a portable dental clinic, West Virginia, 2009. J Am Dent Assoc. 2013;144:1110–1118. U.S. Department of Labor, Occupational Safety and Health Administration. 29 CFR Part 1910.1030. Occupational exposure to bloodborne pathogens; needlesticks and other sharps injuries; final rule. As amended from and includes 29 CFR Part 1910.1030. Occupational exposure to bloodborne pathogens; final rule. Federal Register. 1991;56:64174–64182. Kohn WG, Collins AS, Cleveland JL, Harte JA, Eklund KJ, Malvitz DM. U.S. Centers for Disease Control and Prevention. Guidelines for infection control in dental health-care settings — 2003. MMWR Recomm Rep. 2003;52(RR-17):1–61. Partecke LI, Goerdt AM, Langner I, et al. Incidence of microperformation for surgical gloves depends on duration of wear. Infect Control Hosp Epidemiol. 2009;30:409–414. U.S. Centers for Disease Control and Prevention. Guideline for hand hygiene in health-care settings: recommendations of the Healthcare Infection Control Practices Advisory Committee and the HICPAC/SHEA/APIC/IDSA Hand Hygiene Task Force. MMWR Recomm Rep. 2002;51:No RR–16. U.S. Food and Drug Administration. 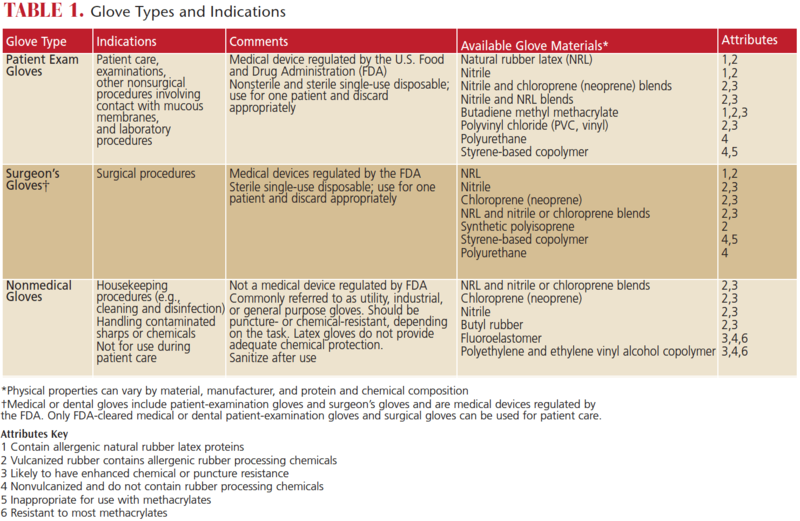 Guidance for Industry and FDA Staff Medical Glove Guidance Manual. Available at: fda.gov/downloads/MedicalDevices/DeviceRegulationandGuidance/GuidanceDocuments/UCM428191.pdf. Accessed March 13, 2018. ASTM Standard F2100. Standard Specification for Performance of Materials Used in Medical Face Masks. Available at: astm.org/Standards/F2100.htm. Accessed March 13, 2018. FDA. Guidance for Industry and FDA Staff: Surgical Masks — Premarket Notification [510(k)] Submissions; Guidance for Industry and FDA. Available at: fda.gov/MedicalDevices/DeviceRegulationandGuidance/GuidanceDocuments/ucm072549.htm. Accessed March 13, 2018. U.S. Department of Labor, Occupational Safety and Health Administration. 29 CFR Part 1910.133. Eye and Face Protection. Available at: https://www.gpo.gov/fdsys/granule/CFR-2013-title29-vol5/CFR-2013-title29-vol5-sec1910-133. Accessed March 13, 2018. U.S. Department of Labor, Occupational Safety and Health Administration. Eye and Face Protection e-tool. Available at: osha.gov/SLTC/etools/eyeandface/faqs.html# protection. Accessed March 13, 2018. U.S. Department of Labor, Occupational Safety and Health Administration. Enforcement Procedures for the Occupational Exposure to Bloodborne Pathogens. Available at: osha.gov/pls/oshaweb/owadisp.show_document?p_table=directives&p_id= 2570. Accessed March 13, 2018. Sehulster LM, Chinn RYW, Arduino MJ, et al. Guidelines for Environmental Infection Control in Health-Care Facilities. Recommendations from CDC and the Healthcare Infection Control Practices Advisory Committee. Chicago: American Society for Healthcare Engineering/American Hospital Association; 2004. U.S. Department of Labor, Occupational Safety and Health Administration. Standard Interpretations. Most Frequently Asked Questions Concerning the Bloodborne Pathogens Standard. Available at: https://www.osha.gov/laws-regs/standardinterpretations/1993-02-01-0. Accessed March 13, 2018. U.S. Centers for Disease Control and Prevention. Sequence for Putting on Personal Protective Equipment (PPE). Available at: https://www.cdc.gov/niosh/npptl/pdfs/PPE-Sequence.pdf. Accessed March 13, 2018. From Decisions in Dentistry. April 2018;4(4):28-30.